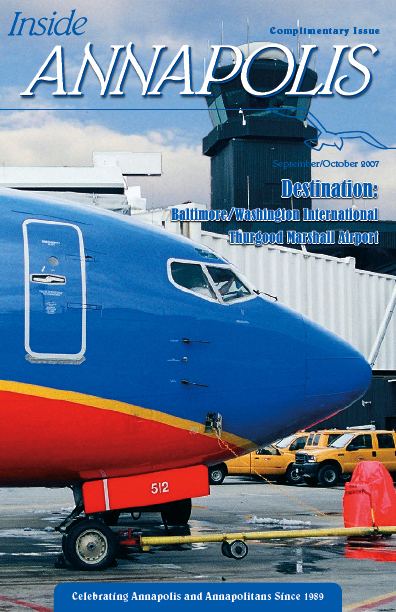 Joseph Patrick Bulko takes a look at Baltimore Washington International renamed in 2005 in honor of United States Supreme Court Justice Thurgood Marshal1 (1908-1993) a Baltimore native. The airport transformations since 1951 when President Harry Truman marched down the runway with the color guard at the grand opening have been profound. The planned conversion to Aerotropolis is the biggest chapter yet. Gioele Settembrini is an ordained Baptist minister, renowned speaker, an accomplished tenor, devoted husband and father all of which make him an extraordinary person and a very special Annapolitan. M.A. Cashman reveals his life’s work and his musical accomplishments in great detail. The publication cycle has changed. Our current issue is September-October 2007! All issues will continue following our new cycle. Call the office today at 410-263-6300 or click on the image below to extend, renew or sign-up for home delivery. "Best Little Magazine in Annapolis"! Enjoy your Annapolis visit more when you stay at any one of our local lodgings! Click here for a direct link to our reservation system and welcome to our city! What event in the Annapolis area are you most looking forward to in 2006? ? 06? 006? Last time we asked, "How many past issues of Inside Annapolis Magazine do you have? " Out of all the responses, we found that most of our readers keep at least 3 issues of Inside Annapolis Magazine around the house, but a couple of our readers have over several years of issues! We're glad to hear that so many of you stay with us!